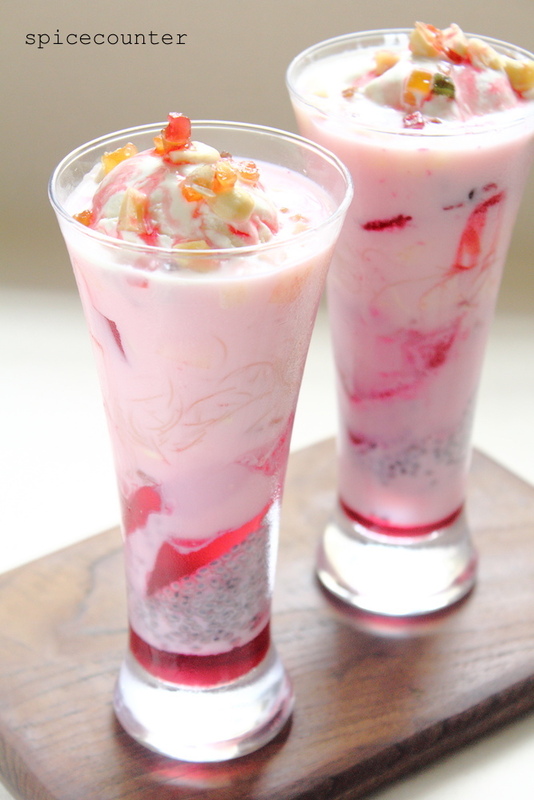 Falooda is a popular cold beverage/dessert in India. However, i never tried it as a child. It is oftensaid that we eat with our eyes. We are completely affected by what we see. As a child i was not tempted to try falooda because i didn’t like how the sabja seeds or basil seeds looked. I never knew how it tasted but i decided i wouldn’t like it and never bothered trying it. As i have grown older i am more open to trying out things. So a while back when i saw a ready mix pack for falooda at the supermarket i decided to try it out and I loved it. That is how i ended up making it from scratch this weekend. 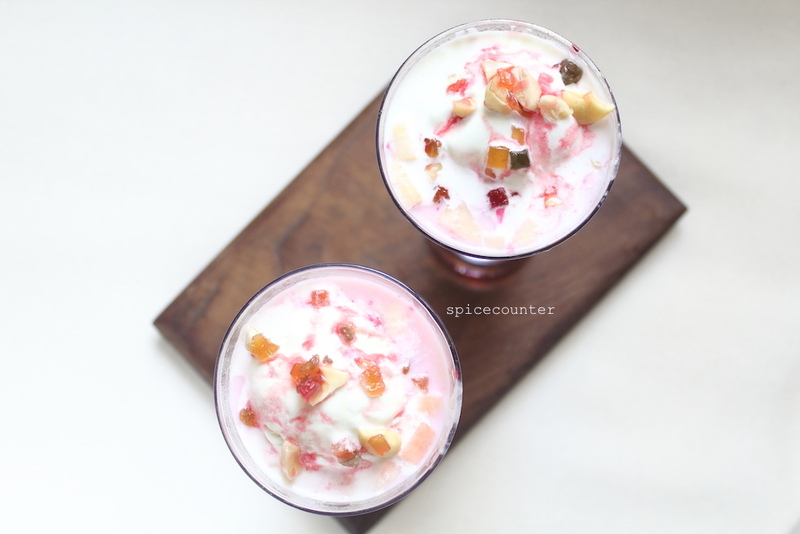 Falooda is quite simple to make and you cannot really go wrong with it. You just need to layer the different ingredients like rose syrup, falooda sev (which i replaced with regular vermicelli), strawberry/raspberry jelly, sabja seeds, fruits, almonds & cashews, tutti froth & ice-cream in a tall glass. Though it seems like a long list not much of prep work goes into falooda. Once you keep the ingredients ready all you need is to layer them in a tall glass and serve cold. I made a template of the layering done for falooda. There is no hard and fast rule you can move around the items mentioned in the middle. One of the key ingredients to make Falooda is rose syrup. I have used rooh-afza instead. Another ingredient that is used for making falooda is the falooda sev which is a kind of vermicelli made using corn starch. Since i could not get falooda sev in the market i replaced it with regular vermicelli. Jelly is also used to make this dish. I bought a packet of strawberry jelly and i think one packet should be enough for 10-11 servings. So there might be a little extra jelly if you are making for just 1 or 2 people. The other ingredients like tutti frutti, mixed fruits, nuts are all optional but they enhance the taste of the Falooda. A popular beverage/dessert in India. Keep aside 2 tall glasses for the falooda. Soak sabja seeds in 2 cups of water for 20 minutes. The seeds will swell. Drain the water and keep the seeds aside. Make strawberry jelly as per instructions in the packet and keep it in the refrigerator to cool. Cook the vermicelli in boiling water. Once done drain the vermicelli and keep it aside. Pour 1 tablespoon of rose syrup of root-afza in the base of each glass. Add 1 tablespoon of the sabja seeds on top the rose syrup. Top this with 2 tablespoons of strawberry jelly. The cut fruits can be layered on top of the jelly followed by the vermicelli. tablespoon of almonds & cashews and 1 tablespoon of tutti fruity can be layered on top of this. Top this with 1 tablespoon of sabja seeds. Now pour the chilled rose milk equally in both the glasses. Add one scoop of ice cream in each glass. Garnish with tutti frutti, almonds & cashews and rose syrup.